"Main-mast staysail up. Do not unfurl. Raise your hands if you hear me." Captain Tony Brookes calmly called his instructions into a handheld from one of his dual on-deck navigation stations near the aft quarter of Athos, the 62m Andre Hoek design he commands. His crew with headsets faithfully obeyed, shooting their hands in the air before quickly jumping into action. So went the day that started with pouring rain and segued into one of the windiest here yet, taking the wind gauge to 28 knots and Athos to speeds as high as 15.8. The owner and his rep Gary Veenman from Holland alternated at the helm, giving each other much-needed breaks from the giant wheel that played tug of war with them. Three trimmers scooted among the 40-some-odd crew, working the joy sticks on their remote control, the 'God boxes' control the hydraulic winches. For someone who normally sails 40-footers, it surely would have been something strange and wonderful to behold, but for those who regularly sail in this rarified world of superyachts it was just another approach to racing one of the most magnificent sailing yachts on the oceans today. Athos' closest competitor today in the Mademoiselles class at the annual St. Barths Bucket was the 55m twin-masted Adela, the steel hulled Dykstra designed Pendennis build that represents a historically significant salvage and rebuild of the 1903 original. Adela had won this 10-boat class yesterday, the first day of racing, and won again today, crossing the finish line first, after the traditional pursuit start had the smallest and slowest boats starting first and the larger and faster boats starting at specific time intervals afterward to try and catch up. Athos, which had finished seventh yesterday, was quite pleased with a second-place finish after being fifth in the pursuit-start line-up. That moved them to fifth overall behind Zefira, Salperton and Lady B. "No one caught us from behind and we passed two others, so we must be doing something right," said Tony Brookes. "It was a hard work race today. Windy and wet, and everyone's uncomfortable but they still have to concentrate on the job they are doing. We had some problems (with the spinnaker hoist) but we dealt with them. It was more like the North Sea instead of the Caribbean there for a while." Aboard Adela, Kim 'Shag' Morten conceded that the Adela crew can sail well in any direction and in any conditions, because they have the choice of sails to make the right calls in any given situation. "Our biggest competition is Athos; we think it comes down to the crew performance," said Morten, adding that he has competed in every Bucket to date, the last three on Adela. "We now have top-of-the-line sails, a carbon fibre mast and a team that has sailed together in the last three superyacht regattas." In Grand Dames class, Georgia rose to the top of the scoreboard after taking today's race. Blue Too, which was leading going into today, retired after a crew was injured and fell to seventh with a finish score today of 13. 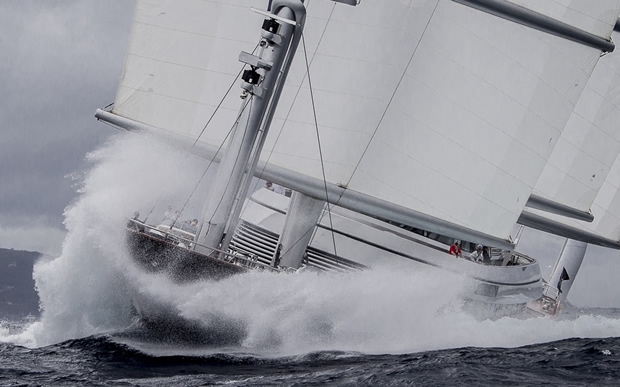 In the Gazelle class, Visione maintained its first position overall with a fifth-place finish today. However, they are tied on point score (6) with both P2 and Cape Arrow, with Unfurled only one point behind. Hanuman claimed another bullet, its third, in the J Boat class today. When asked what was different about today, tactician Kevin Burnham joked, "Nothing, we won the race!" But in all honesty, the win didn't come easy. "The biggest challenge in pushing that type of machine around the race course (in today's conditions) is that stuff gets shocked-waved," said Burnham. "We blew up a kite - it just exploded into a million pieces." The crews on all 36 Bucket boats are glad to be back on terra firma for tonight's pirate-themed 'Bucket Bash'. The party should do its part to prepare them for tomorrow's Wrong-Way Around (the island) Course.